Remember the Shortcut Monster Finger Treats we shared yesterday? 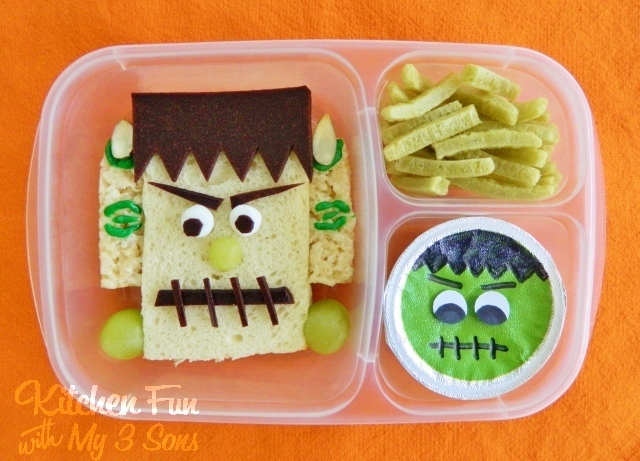 Well we added those monster fingers to this fun Frankenstein Bento Lunch! 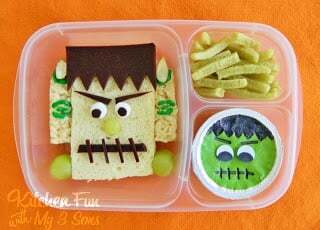 This is a easy Halloween lunch to make for the kids and they will love opening this up for lunch at school! We started out by cutting off the crust from our bread into a rectangle. Make whatever sandwich your kids like. We cut off a thin strip from the fruit leather using kitchen scissors. We made Frankenstein’s mouth with the thin strip. We then cut out zig zags from the rest of the fruit leather to make his hair. We made eye brows and pupils using scraps. Cut a mini marshmallow in half for the eyes. We placed 2 green grapes on the bottom sides for his electrodes. We added spinach veggie straws. We decorated the apple sauce using black marker. Kroger brand apple sauce is solid green on top. We added our Shortcut Monster Finger Treats next to Frank’s head for dessert. 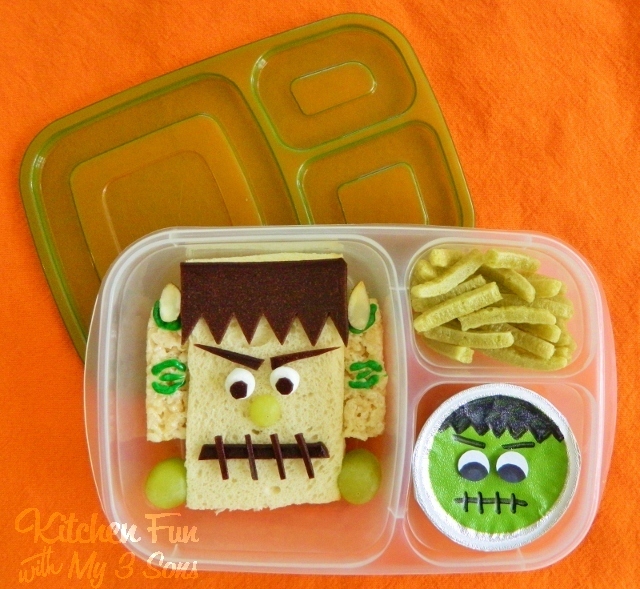 We used Easy Lunchboxes to make this fun Halloween bento! 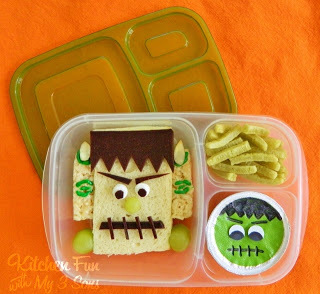 The green monster on the apple sauce container is so fun and the monster sandwich is great! Too cute! What kid wouldn't love this in their lunch box? This is too cute! My daughter would love this! What a cute lunch! My son is obsessed with Halloween, he would love this. Just found you from a link up. I love this! My son would freak out if I put this in his lunch! Thankyou for reminding me how fun packing lunches CAN be. Cant wait to look around! You are wesome!! 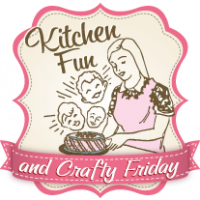 Can you please come link up all your ideas at our Fun Lunch Round Up and link party? 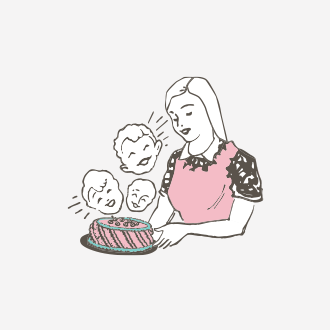 We need you to share all your fabulous ideas with everyone!! This is so cute!! I wish my lunches would have been this cute as a kid. How fun! What a great mom you are. My kids would love it if I did this for them. I am featuring this at somedaycrafts.blogspot.com. What a cute lunch, my kids would love it! hi there! I featured this on my blog today. Thanks for sharing it at my link party last week. 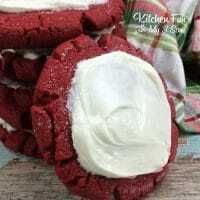 I would love if you would stop by again today to link up. This lunch looks like so much fun! (I have the same lunchboxes. Love them!!!) I love this monster project, and I’ll be featuring it on OneCreativeMommy.com tomorrow. Please feel free to stop by and grab a featured button.